The theme for Portugal could be fish. A fish is the subject of 30% of the many fridge magnets on sale. Another 30% are of very colourful roosters and, who cares about the remainder. Besides fish magnets, Portugal has many types of fish, fish stews, fish symbols and today, many fish under our kayaks. (Thanks to Peggy for the use of her kayaking and water based photos). We took kayaks out from the wharves at Sesimbra around the coast to a very nice little beach half encircled by towered cliffs. Spectacular. Absolutely spectacular. Huge towering semicircular rock face. Not complete as there was obviously a narrow walking track down one side. 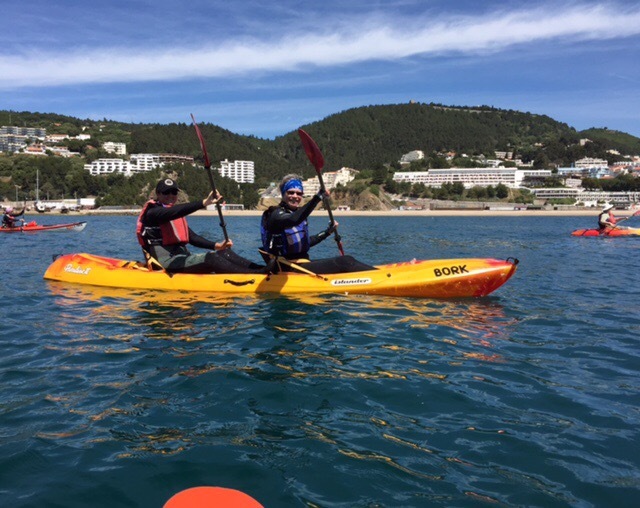 I was in a double kayak with Jodie, others variously in doubles or singles depending on desires and competence. J and I managed well. She sat in the back and worked hard getting us through rock tunnels and around the other kayaks. Note the working together! Yes, thanks to J being camera conscious and getting paddles positioned each time! 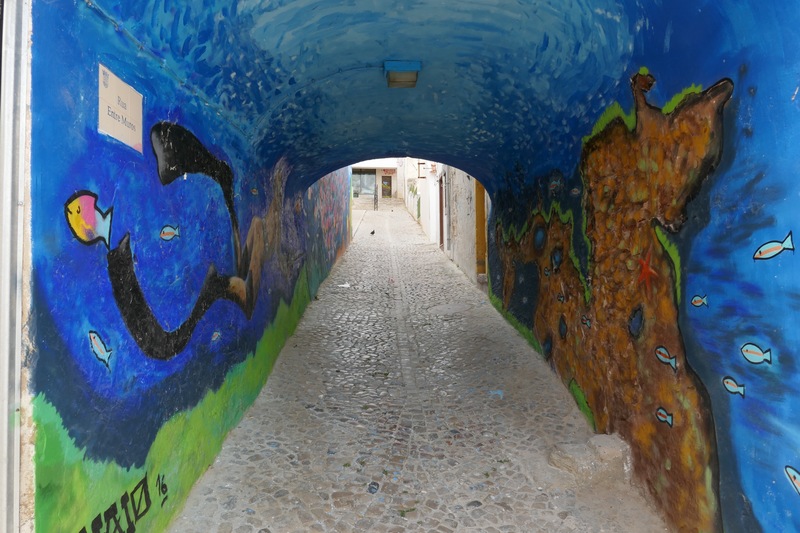 Back to Sesimbra mid afternoon. Some walked up the hill to the nearby castle. I had time off. The ‘castles’ I’d seen in Portugal by then were quite uninteresting. 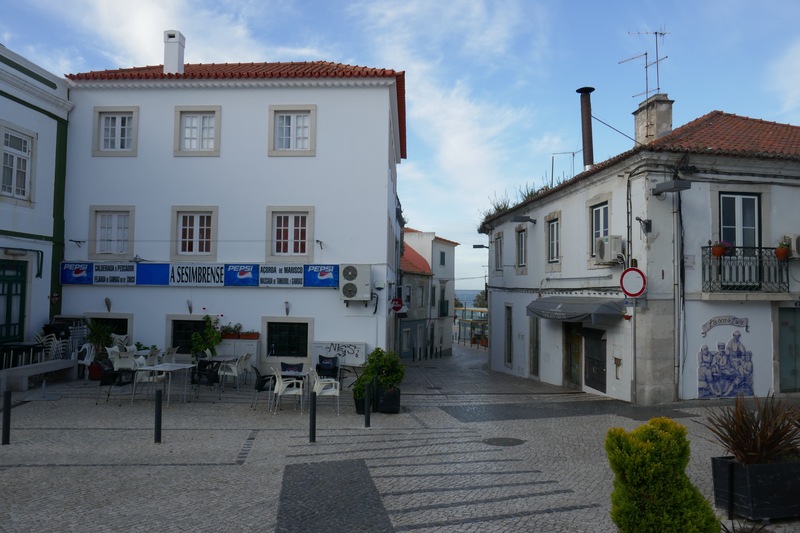 Besides, I wanted to see the town of Sesimbra. 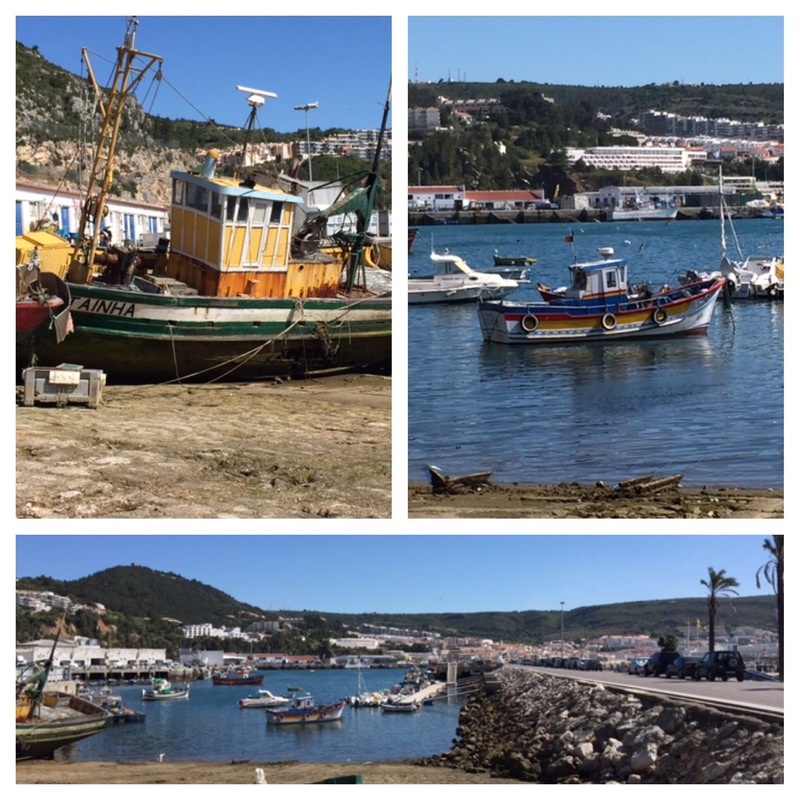 A beautiful, touristy little fishing village south of Lisbon, on the edge of a national park. The park has both a marine and a land component. The significance of the marine component is the huge number of fish visible just under the surface as you glide over the water. And they are not fingerlings but reasonably sized fish, a type of bass. No commercial fishing is permitted in that area but many fishing boats moor here. 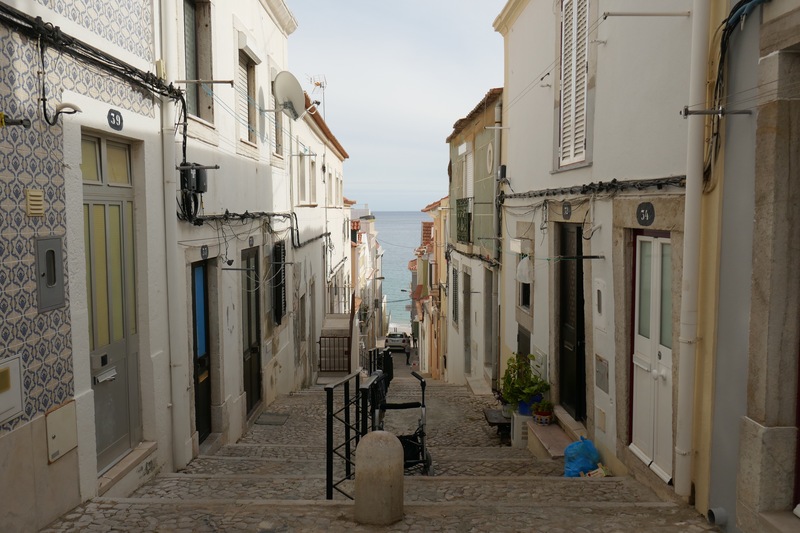 Back to the town of Sesimbra: beautiful but not one I’d plan on revisiting. A few interesting small streets but not much else to recommend it. The many very large hotels and waterfront restaurants are giveaways for the tourism and fishing that are the local industries in this sheltered little bay. The number of people in the few places I’ve been in Portugal who speak good english is astounding. So many more than in Spain. So many more. Few in Spain speak anything other than Spanish. One reason someone suggested is that a lot of tv in Portugal is subtitled, the spoken language remaining as english. In spain, most tv is fully dubbed, no subtitles usually. So, an interesting idea given the inter country differences. An interpreter I sat next to on a plane said the lack of dubbing of tv in Holland has the same effect: the locals have a greater facility with other languages. Many functional words in Portuguese read like their Spanish equivalent but the sounds are quite different. 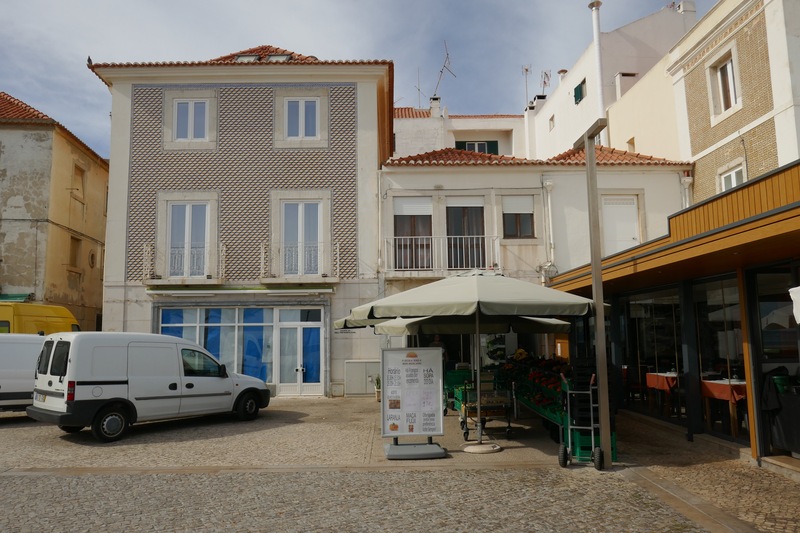 Easy to get a cafe con leche, easier if you ask for a ‘galão’! Lots of ‘false friends’, I’m sure, words that actually have a very different meaning than you might think if you base your interpretation on Spanish or english. Like ’embarazara’ in Spanish. NOT to be conflated with ’embarrassed’ in english! What could be more important than coffee! We are always on the go. We start late, usually breakfast is at 8 or 9am. We end our day with a 3 course dinner starting between 19:30 and 20:00, and ending sometime between 21:30 and 22:30. This means every night is late, a 23:00 bedtime by the time we get back to the hotel. I’m finding it hard to sleep past 05:00. Last night we had a nice dinner at a restaurant specialising in grilled chicken. Two of us had grilled squid instead, very nice with the tomatoes, lettuce and the ubiquitous, and numerous, boiled potatoes. 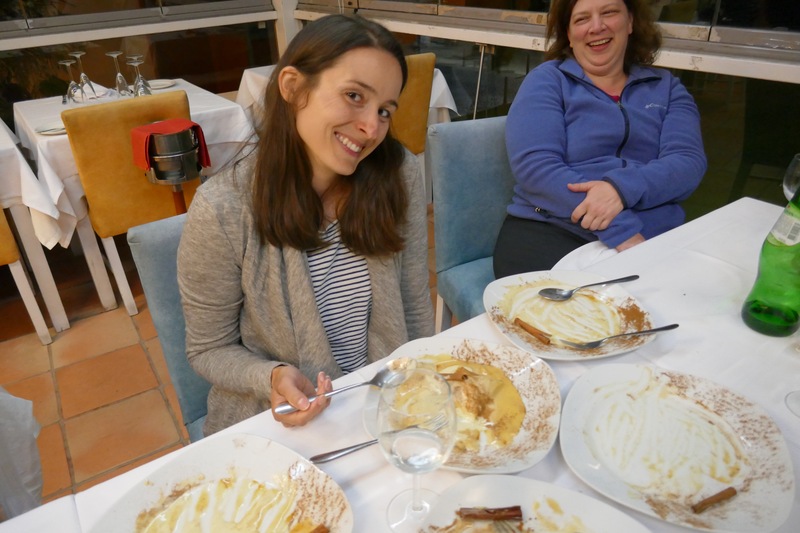 This all followed a very nice bread and a soft sheep cheese and was finished by desserts. The range of desserts is always impressive, many being bought in by the restaurant but definitely not all. I usually have the melon (white flesh) as it’s delicious and not something I can get at home. Some said that to multiple desserts per meal! Count the plates.. Reminds me: the bread we’ve had in Portugal has been really really nice. Breakfast yesterday included flat bread rolls, brown and minimally leavened. Dammit we are having to breakfast elsewhere today to get going early. Fingers crossed we get a similar option. We did, a wonderful whitish bread. Very tasty. Hmmm. Easy to imagine forecasting Portuguese weather would be difficult with a large open ocean to its west.